Fox News pulled Saturday’s episode of the Justice with Judge Jeanine Pirro show that regularly airs at 9 PM on Saturday. This comes on the heels of her controversial remarks she made about Rep. Ilhan Omar on her previous show. Pirro’s show was replaced with a repeat airing of the documentary series “Scandalous: The Trial of William Kennedy Smith,” according to the Fox News schedule. Fox News had admonished Pirro for her comment while several sponsors have left her show. It is unknown at this time whether the show will return. A representative for Fox News did not comment on Pirro’s status or the reason for the programming change. But the switch appears to be related to Pirro’s March 9 comment about Rep. Ilhan Omar ( D-Minn.), who wears a hijab, a traditional head covering worn by Muslim women. Omar, an immigrant from Somalia, has stirred public outrage over tweets she’s made regarding U.S. support of Israel that were interpreted as anti-Semitic. Fox News, which typically stands by its hosts when they make controversial statements, issued a public rebuke of Pirro over the comments about Omar. At least four advertisers — personal finance company NerdWallet, online marketplace Letgo and drugmakers Allergan and NovoNordisk — have said they have suspended their sponsorship of Pirro’s program because of her remarks about Omar. 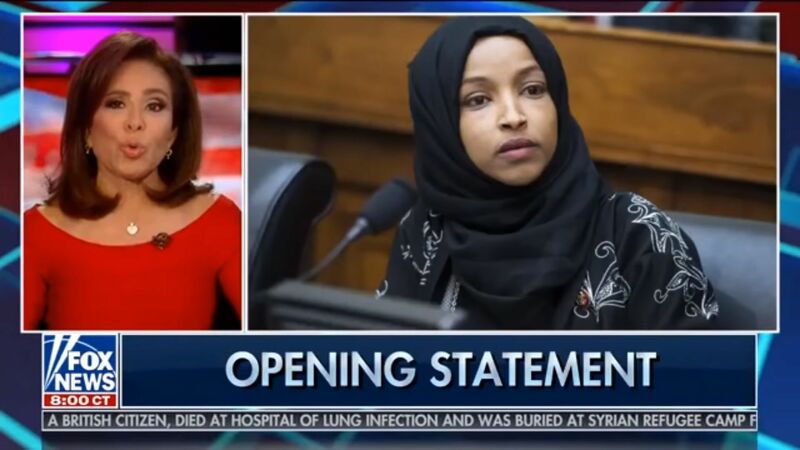 The controversial comment Pirro made was during a commentary she was given about Omar’s anti-Semitic rhetoric and how it effects the Democratic Party. Pirro posed a question that in essence questioned whether Omar holds Sharia law above the Constitution. You and the whole gang running for President in the Democratic primary in 2020 have appeased the rise of antisemitism in the Democrat party. The sad part is that all this is contrary to the tenants of your party, which is so receptive to the LGBTQ community, illegal immigrants, refugees and on and on. This is not what your party is. I think her comments are spot on. Thank you for naming the sponsors that I will no longer use. Fox executives may be biting the conservative hand that feeds them. Watch it. Judge Pirro is correct…I love her show. Her opening statement on Omar was spot on. You are opressing her free speech and I want her show back on…..FOX better not start bowing to the left…They will lose ..
Fox would be foolish to end the relationship with the Judge based on her asking important questions. Questions most think but are afraid to ask. As viewers we have a right to hear her questions and opinions. I think CAIR is behind the move to silence anyone who questions or says anything negative about Muslims. This should alarm all Americans, especially those of us that value free speech. I think Ilhan should be removed from the her seat in government for her actions and remarks…the Judge was right on with her comments and fox should put her show back on !!!! The American people are watching You Fox. If you do this you will lose. Bring back Judge Jeanine!! Every thing she says is great!! Get a backbone Fox!! I thought only CNN persecuted people for TELLING THE TRUTH!!! Bring back he Judge FOX. Fascinating isn’t it? There are few voices proclaiming just what the Muslim community want to do to America and then when an honest journalist state the facts, they are quieted. Perhaps we will find another source of conservative truth-telling. American viewers do not have to stand for the suppression of truth. Muslims want control of the globe and that means they want death to everyone who will not convert to their ways. Obama is the biggest cause of this invasion of Muslims, bring in thousands and settling them in Michigan and Minnesota. He can burn in hell. Either reinstate Judge Jennine or lose your viewers. There are other channels coming forth OAN for one. One of the dumbest moves I have ever seen………..What’s wrong with them? What did she say that was untrue???? ?